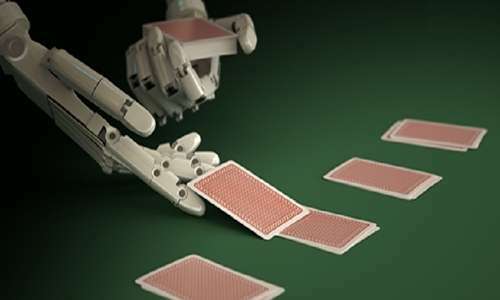 The US-facing Winning Poker Network (WPN) and its flagship site, Americas Cardroom (ACR), have become more serious about combatting a surge in botting (automated, software-driven online poker activity) and other bot-related activity in the wake of clear bot-based play being publicly shared via a prominent Twitch post by another WPN player. The WPN/ACR botting identified as coming from a ring likely centered in Ogre, Latvia involves both tourney and cash-game play, but appears more focused on tournament-based cheating. This latest bot-related furor erupted about nine days ago when an ACR account (“TheKamist”) run by Eric Collier ended up heads-up against account “FoxRox” in a $16.50 buy-in, $10,000-guaranteed event on ACR. Collier was streaming the final table via Twitch, and when heads-up play arrived, FoxRox (who had the lead) began behaving in a strange, strange, way. With one or two exceptions, the FoxRox account either snap-folded its small blind and the button to TheKamist’s big blind, or folded the big blind to a minimum three-bet by the Kamist, but almost always after a nearly-nine-second delay. That FoxRox was a malfunctioning bot account was immediately clear to virtually every viewer of the stream. (To watch the exposed bot malfunctioning, view the last portion of Collins’s Twitch stream here.) As with many other operators, WPN has long been accused of being less than proactive in investigating and combatting alleged bot activity, yet here it was presented with a case of very blatant cheating, offered very publicly in a video that went viral in online-poker terms. The new reimbursement policy drew both praise and criticism from WPN’s players. In the praise category, it was great to see WPN and ACR appear to step up their enforcement game against bots and botting players, thereby joining an increasing wave of moves by online operators to stamp out bot-based play. In the damning-with-faint-praise category came comments regarding the long, long delay by WPN and ACR in cracking down on the bots — in this case, arguably, after a full-frontal face egging — and in capping the amounts to be refunded to cheated players at $25,000 per confirmed bot account. We reimburse money won from players by accounts proven to be breaking WPN’s fair play policies. We use the following method for reimbursement. a) Tournaments – Ladder Up: We remove the offending player from the payout spot and move each lower payout spot up one position and pay each player the difference between his old spot and new spot. b) Cash games – We subtract losses to the offending player from wins taken from the offending player in a given session. 2. We reimburse to a cap of $25,000 per offending player. The reimbursed funds are distributed to affected players beginning with the most recent occurrence to the oldest. WPN/ACR ignored the $25,000 in redistributing refunds to the first identified and banned account, FoxRox, likely in part because the account had been the subject of numerous botting and collusion complaints dating back to at least 2017. The $25,000 refund cap was implemented for the second botting account to be identified and banned, “Gluckauf”, which was also involved in major soft-play accusations with FoxRox back in 2017. However, the refunds for the Gluckauf cheating, being capped at $25,000, will extend back to only early February of 2019, even though its cheating likely goes back far, far longer than that. The reason for the cap can’t really be anything other than an attempt to limit WPN’s long-term exposure as it finally embarks on a serious cleanup of its apparent bot problem, well after the fact. WPN and ACR are putting their best face forward by offering the “first in the industry” spin, even if it’s something of a lipstick-on-a-pig exercise. Still, any refunds to cheated players are a big deal, and to the extent that those refunds go, WPN/ACR gets some credit. The second account to be banned, Gluckauf, also apparently comes from the small city of Ogre, Latvia, just as with FoxRox. The central Latvian city has a population of about 23,000 these days, and two major bot accounts coming from the same small city is a multiple-sigma indicator of a cheating ring at work. Since there are several more high-volume, winning WPN players also claiming Ogre as a city of residence, it’s a safe bet more investigations are underway and more seizures are likely to be announced. Not only WPN, but all online operators should be mindful of such statistical outliers as leading indicators that something isn’t right, just as happened with the infamous DON (double or nothing) cheating ring from China on PokerStars several years ago.